Protect your personal data simply and for free at home or on journey. Delete unnecessary files reliably and unrecoverably. Create secure passwords and save them along with access data and secret information into secured databases. Work with archives of all common types including self-extracting and secured. Set the security level according to your needs with the security profiles. Get a new standard of personal data protection for free. Easily protect your photographs, documents and passwords for free! ...... secret information into a secured database. Safetica is an easy-to-use software. A fast wizard will make the setting after installation easier and thanks to security profiles you will easily set the level of security so that it suits your demands. Don't let identity thieves harm you! Download Safetica Free today and there will be no more stolen passwords or lost files for you! * Protection of important data at home and on journey. * Encryption of files, hard and portable disks. * Secure removal of files, browser history, bin and temporary files. Non-recoverable. * Reliable password manager. All passwords and secret data accessible with a single password. * Generator and password strength indicator will help you create a strong enough password. * Security profiles allow simple selection of the security level. 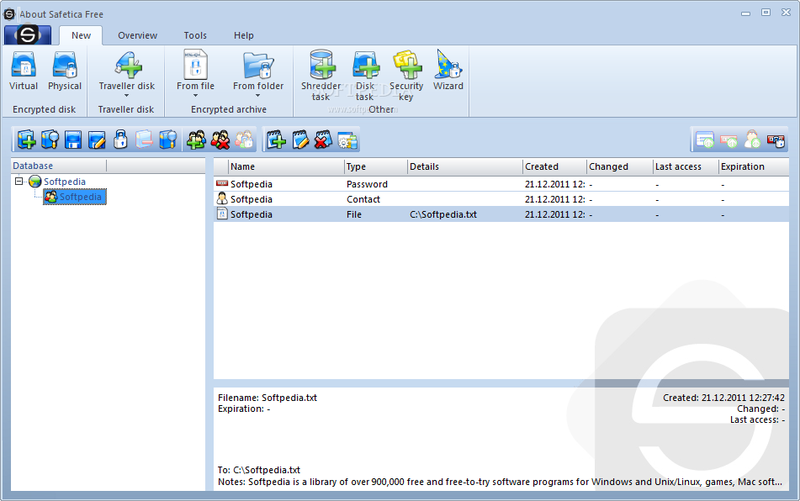 Qweas is providing links to Safetica PERSONAL 4.0.10 as a courtesy, and makes no representations regarding Safetica PERSONAL or any other applications or any information related thereto. Any questions, complaints or claims regarding this application Safetica PERSONAL 4.0.10 must be directed to the appropriate software vendor. You may click the publisher link of Safetica PERSONAL on the top of this page to get more details about the vendor.